Will Microsoft finally harness collaboration with new features in Office 365? At IT conferences I always try to attend sessions that are not only technical but also focus on management and collaboration. I always wonder how a given feature or solution would influence the productivity of the teams I work with, and whether it would help at all, or whether the result would be the exact opposite of what was expected. I’ve heard of companies blocking internal IM features in Skype for Business due to the fact that some employees spent too much time chatting, and that the key employees were constantly flooded with IMs until they decided to permanently log off from the program. Obviously, the tool is just a tool, and some internal rules are always required to use it properly. But a user is just a user and “old habits die hard”. Just take a look at Public Folders and how many times Microsoft has tried to publicly assassinate them. I was, however, surprised to see how many IT pros at this year’s IT/DEV Connections in Las Vegas and UC Day in Birmingham expressed their interest in Office 365 Groups. It’s not just Microsoft’s sales pitch and global marketing explosion, it’s really the users who are actively interested in this feature. Since Office 365 groups are pretty new, it’s still hard to tell whether it’s just an attractive feature or a solution that will ultimately change the way of collaboration of Office 365 users. Perhaps My Analytics, Delve and machine learning in Office 365 will help organizations to better understand how they collaborate and what can be changed or optimized to enhance productivity. This year at IT/Dev Connections I had a chance to talk with one of the best IT consultants in the world – Michel de Rooij and Maarten Piederiet. We focused on collaboration and whether Microsoft has the chance to finally do it the right way. Can Skype’s internal IMs influence the productivity in a negative way? And how My Analytics, Delve and machine learning will influence the way it will be used in organizations in the future? I don’t think that instant messaging is influencing productivity in a negative way. I think it actually helps people who usually would revert to using email. By using instant messaging they actually contact someone directly, and try to get a quick feedback without sending them an email. But it depends on the type of people you have in your organization. So, if people are not used to instant messaging, like if you have a tax company, for example, they usually have older people working there, they’re not used to such productivity improvements, I would say. So it really depends on the people. And, for example, if you use instant messaging and people are online, or appear to be online, but they are actually not, then it actually still ends up in someone’s Inbox and becomes and email. So at that point I think you’ve lost the purpose for that specific message. So if this becomes visible by using tools, like Graph, then it starts depending on the management… and how they will act on such numbers. And that all ends up in what is your company culture. So, if the management will get access to the Graph and see this data, they will probably think that you will not have been working on the thing you should have been working. I think IM is a convenience tool, because in my personal work I sometimes have multiple conversations going on with instant messaging, with popping of quick questions to a lot of people, (and then) I just keep the dialog open, I don’t have to wait for answers, and it will notify me when a person has responded. It’s a different flow from email, with questions and answers that can wait a bit, or it’s not an urgency. On the other hand, I can also see in some organizations where they have implemented instant messaging… And, a friend at another company has also implemented instant messaging in an open federation. And sometimes we have non-business conversation during the day and stuff like that. Then that might of course also show up in Delve and Graph in the future. So yeah, then it’s a question of if that information can be used for holding people responsible for doing non business stuff at work. So it’s a difficult topic, I think. Yeah, I guess it’s controversial. If you look at this from e.g. a manager’s perspective of an online shop with an online chat feature. The chat is the most convenient option for the client and it is the least convenient option for the shop (in terms of productivity), because sales people have to spend a lot of time chatting with clients. Usually, if they were to send an email they would be able to do a lot of things asynchronically. If they had this conversation on the phone, it would be also quicker. It usually works this way: “Hi!”… “Hello!”… “What can I do for you?” And then the customer is typing the message and the salesperson is looking at the screen, and it takes 2 minutes until the question finally pops up. So, I think the same problem might be with instant messaging when it’s done internally, between employees of the same company. And the other question is about Office 365 Groups. Here, at IT/Dev Connections there’s been a bunch of sessions on that, and we all feel that Microsoft is doing their best to promote it. And that there are also vendors who are supporting the migration to Office 365 Groups. So, the question is, what do you think about the Public Folders migration, about the companies who are currently on-premises and will be migrating to Office 365, or the ones that are already on Office 365 and using Public Folders – would they want to migrate to Office 365 Groups and whether this is a technological challenge or also a management challenge because you have to create new workflows and procedures for collaboration? The consultant’s answer that pops up immediately is, again, it depends. I think that the migration of Public Folders is mostly a business driven action. You can’t solve it in a technological way, because of the way people have been using the previous folders. So first you need to create the insight in what it’s used for. And usually you can’t even get that insight, because you’re not the one using it. So you need some insight from the business (from the users and managers) on how they currently use those folders and what they would like to achieve with them in the target location. You need to define the target group which you would like to reach with that specific folder. For example, if it’s for a small number for people collaborating on a project, then Office 365 Groups is obviously the way to go. But if you have a specific folder, with Contacts for example, which you want to share across the entire organization, then Office 365 Groups is most probably not the best option for that. There’s no straight path from A to B. There’s going to be choices to be made and I think that’s the basics of every migration. It’s not forklifting. You have to know where you’re going and you have to know where you come from. There’s going to be decisions to be made and we, as consultants, can help here, but it’s the company that decides, the business decides. I think there needs to be some sort of period where people start getting used to the tools, see how it should be used more effectively. Because now, probably, other workloads will now also integrate with Groups. For example, Yammer. I think it’s a learning phase on how to store all the workloads together in a collaborative entity, and have information there regarding correspondence, file storage and… how to organize it so that people can use it more efficiently. The Office 365 Groups app for mobile devices. Have you guys used this one? No, not personally. I haven’t seen it. In the company I work for currently, they are actually blocking Groups to be used because of compliance. Up till, I think 5 weeks ago there was no option to enable legal hold on Groups. Because of that, they were not allowed to use it. And I’m not sure whether they will enable them in short term. That was the reason for disabling. It’s a big shortcoming at the moment, but they’re working on that, that it’s only going to be a hard delete for the Groups. So if you delete the group, then it’s forever gone. Yeah, it’s something that a lot of people are concerned about. So, just one last question. There’s a dedicated mobile app for Office 365 Groups but its calendars and contacts do not integrate with native contacts and calendar apps. Is this a problem for users? To be honest – yes. Because, I think that’s one of the main reasons why Yammer, for example, was not really used in enterprises. People like the single pane of glass, which Outlook currently is for them. And it’s like, an Inbox is a workload for most people. And calendars and tasks and contacts, you want them all in the same integrated view. And, if you now have to use different apps, then people have to manually decide which app to open and find their stuff, and… I think it will be an issue for usability. So, the biggest problem with accessing Public Folders from mobile devices via Active Sync is, in some way, not solved, even if you have Office 365 Groups. No, but it also opens additional possibilities. For example, with the connectors you can integrate feeds, or do intelligent stuff to insert information in the Group feed. So it’s really flexible, but it can also become quite messy, of course, if you don’t have some sort of control or management over those Groups. So that will be a challenge as well. 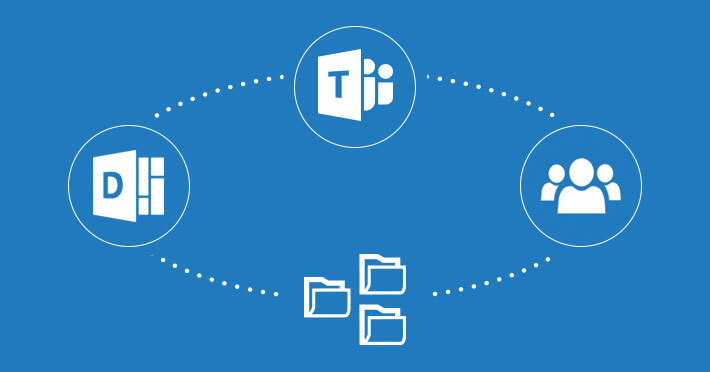 It looks like there’s a lot to be done until Office 365 becomes an ideal collaboration solution for every business. Nonetheless, it looks like Microsoft is finally on the right path as Office 365 groups are the first solution that really strives to integrate every little piece that Office 365 offers into one platform, and Office 365 Teams Preview has just been announced. Since Office 365 groups are born in the cloud, they make use of Delve and machine learning. It also turns out that My Analytics might help change inefficient working habits by telling the users how much time they waste every day because of multitasking at meetings, or because of having meetings with too many people, or simply by spending too much time on reading and writing emails or IMs (currently My Analytics does not track Skype of Business usage). It’s worth noting that My Analytics provides detailed “productivity” insights only to a given user. General productivity information for a given organization is based on anonymous data so it will be impossible for the manager to actually track lazy workers and tell them that they’ve spent 120 hours last month on chatting with a colleague, or to track Navy Seals of office productivity to give them a Medal of 365 Honor. I’m still not sure whether it’s good or bad for the company that the productivity statistics are based on anonymous data, but the main purpose of Delve is to understand how technology is used inside an organization and if there are any recognizable patterns the company might change (if qualified as inefficient) or automate. Perhaps the other things should be controlled by the company culture and holistically, by managers. How do I create an email with MailChimp template design? It depends on your design. Office 365 can add disclaimers and headers to emails (http://www.mail-signatures.com/articles/configuring-organization-wide-email-signatures-in-office-365/?sts=6505) and it lets you force force font format in OWA (https://technet.microsoft.com/en-us/library/dd638117(v=exchg.160).aspx).